The client is a franchisee of a fortune 500 company involved in the Real Estate business. The key requirement of the client was maintenance account for the Real Estate Agents working with in the client's company to enable entry of charges and expenses and commission earnings. The professionals of STPL possess a deep understanding of Real Estate industry as well as the issues involved with financial systems. Experience of STPL with Oracle Applications, Interfacing of other book keeping system was particularly useful. This application is mainly to show expense details under sales representative. A tree structure display with folding and unfolding option is used to display the Details of particular folder. Data Entry Person can enter various records at a time for various Sales Representatives and is not required to move to different pages for different Sales Representatives and different Expense Type. This application can be attached to any of the Real Estate, Escrow or Title Company Application to manage all type of accounts and expenses done by their Sales Representatives on the Real Estate Agents. The module is developed so that it is compatible with other .net products also. Data Entry Person can create folders depending on the Expense Type dynamically and can set folder name so he or she can access this folder in future. Folders are set as a tree structure form which root shows name of sales representative. Folders can be set in Other Expenses or Recurring Expenses according to choice. Two main module of this project are Other Expenses and Recurring Expenses. Only these information are changed when person interact with this project. For checking monthly details of Other Expense, person should go in tree structure and should select a folder name from particular month. But in Recurring Expenses, person can also check the information of quarterly details, monthly details and average details. For selecting different Sales Representative we just have to move the cursor on the left corner and the list of Sales Representative appears on the roll over window and by selecting any of the Sales Representative we can get all of his details. 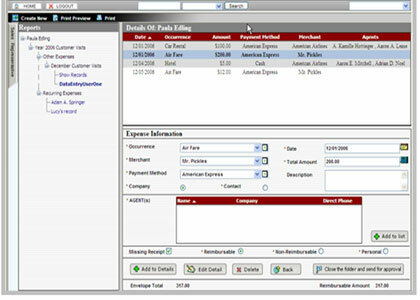 With this module user can check Expense information by selecting a row from details of particular sales representative. Expense information shows the payment method, merchant name, date of expense, occurrence of that expense and description of that expense. Agent(s) list show the name of agents those are involved for particular expense. Data Entry Person can add agent(s) for an expense from a list of agent(s) which appears in a popup menu. Person can add details of new expense which will appear in details of sales representative for a particular folder. Whenever person wants he or she can delete expense information which appears in details of sales representative. Person can edit details of an expense which appears in expense information. Envelope Totals are the total of all the amounts of the Expenses in the selected folder whether it is Reimbursable or Non-Reimbursable. Reimbursable Amount is the total of all the amounts of the Expenses in the selected folder which is Reimbursable. The client required that all the Expenses should be categorized on the basis of their nature and the provision should be there that the Expenses which has to be reimbursed should be approved by the higher authority and also all the entry should not take much more page movement as the entry has to be done by the data entry persons. They wanted that the Project should contain all the list of Sales Representative on the same page as well as the details of expenses of the selected sales representative on that page only. The implementation of Recurring Expense was challenging and innovative as on the same function we have to manage the checks of Average, Monthly and Quarterly Calculations depending on the checks. The most challenging phase of this project was database part as it required the portability concept so that it can be connected to any of the .NET web application dealing with Real Estate Transactions by importing maximum of three tables. STPL Inc. Designed and developed the innovative solution to meet all the requirements of the client. STPL transformed the business logic into product and presented the case in a manner that could help client to achieve maximum returns. STPL with strong project management skill, Quality control and support developed and delivered class product using dynamic database model. STPL Inc. provided a solution to display and operate various data and operations with minimum page movement. For this application is using a Roll over window just like Visual Studio for selecting different Sales Representative and also for selecting the list of different type of expenses. STPL Inc. transformed the business logic into product to affect only future transactions without affecting previously entered transactions while editing and deleting any of the expense information. STPL Inc. also provided a solution in the form of tree structure for showing expense information of Recurring and Non Recurring expenses. So user can get information just by clicking a node of tree. .Net Framework, ASP.Net, C#, IIS.